A group of 40 pupils in S4 are taking a trip to visit the battlefields in Belgium and France this summer — and as part of their plans for the trip, they are appealing for members of the public who can help them to pay their respects in a special way. 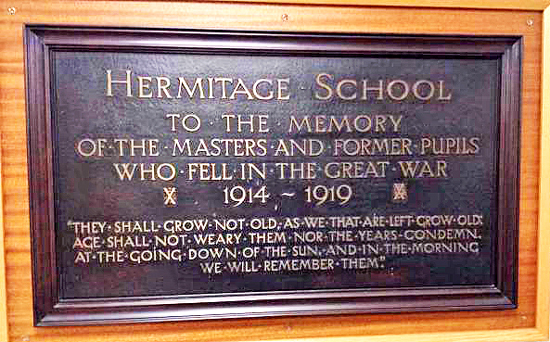 The school has a memorial beside its main office to remember those who died in the Great War, but a second part which contained names has been lost over time. Now they hope to rediscover as many of the missing names as possible. With this year being the centenary of the Armistice which ended the war, the pupils are hoping to create a small memorial which they can place at the graves of anyone local they can find. The party will leave for Messine, Belgium, on June 13. They will visit the Ypres Salient cemetery, then make their way to France to the Somme and Thiepval Memorial. Teachers have arranged for the school to be represented at the Last Post ceremony at the Menin Gate in Ypres. History teacher Craig Gilmour said: “The war memorial has a strong place within the ethos of the school. “It is situated in a prominent place beside the main office and pupils pass it every day. "The memorial is also one of the focal points for the annual remembrance service, and this year we would like to create a display of the names of the fallen.